The Kiss-Cam has become something of a tradition in sports arenas throughout the US. Most times, couples find it romantic and fun ... but it can get a little weird. The two people shown in this video were filmed during a Minnesota Gophers game, and while they appear comfortable together, they are far from all over each other. When they are shown on the Jumbotron, the crowd patiently awaits their kiss, but the two are reluctant -- and with good reason: they are brother and sister. 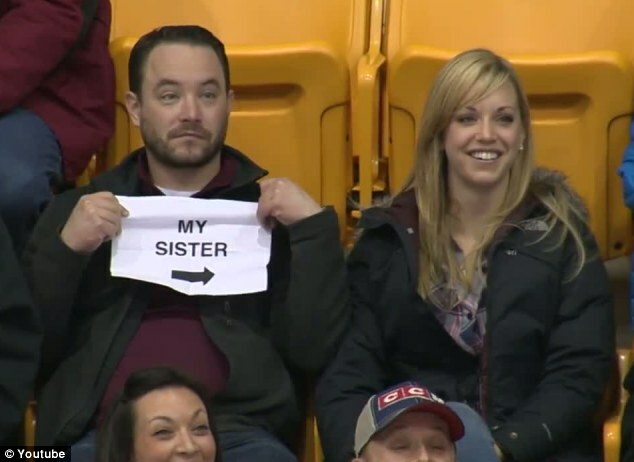 We assume this has happened to the siblings before, because this time the brother came prepared with a sign explaining their relationship.